I like to scent things. It’s true, I do. Also, it’s The Oscars this weekend so it feels only right that I should tie the two things together. In my Scent a Celebrity Series, I try to pick perfumes that represent the personalities, characters and style of some of my favourite celebrities, whether they be real or fictional. This post is an extension of this idea, of sorts, but instead of looking at the celebrities, I’m casting my fragrant eye over something entirely more important – their fashion. The Oscars mean one thing – the red carpet. And what does the red carpet bring? Fashion, and lots of it. Like most people, I’m not as fussed about the Awards themselves (although I am rooting for Eddie Redmayne and Julianne Moore for the Best Actor and Best Actress gongs this year) as I am the fashion. I may skip through the ceremony, but you can bet your bottom dollar that I’ll be tuning in to the red carpet in full, not to mention Fashion Police on the following day to get a full post game analysis of who wore what, and whether it was good, bad or ugly. So, in anticipation of some truly awesome red carpet fashion this weekend (those celebrities better not disappoint), I have put together six of my favourite iconic Oscar looks (I couldn’t settle on five) and have scented them with some decadently glam fragrances to match. It’s all about to get a bit ‘Hollywood’ up in here, so get the popcorn on, throw on your most glamorous onesie and get set to enjoy some truly high-fashion red carpet and perfume moments. 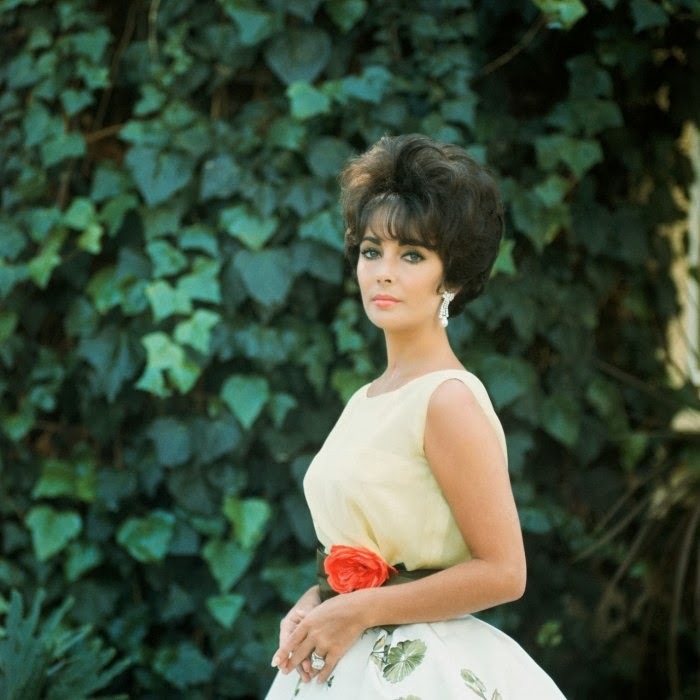 Ahh, Elizabeth Taylor. They don’t make them like you anymore. You were a true movie star – a classic beauty unrivalled and unparalleled. You had a gravitas on screen that would captivate the most cynical and unwilling of viewer and your red carpet couture was to die for. My favourite look of Liz’s on the red carpet was the gorgeous Christian Dior number she wore in 1961 – the year she scooped the Best Actress Oscar for her performance in Butterfield 8. Liz in Dior was pure class and any scent that would be befitting of this holy pairing would definitely need to be a classic. There’s a simplicity to the spring-like feel of this dress, with its single red rose on the belt and floral pattern on the skirt, that makes me think of Balmain’s Vent Vert. This green floral made in the classic style is serene and understated, allowing Liz’s beauty to shine through, rather than shrouding it in a cloud of make up powder and aldehydes. After all, when you were that gorgeous, you really didn’t need much olfactory assistance. Now we move from the sublime to the ridiculous. There are few collaborations more astoundingly over the top than Cher and Bob Mackie. Mackie brings out the inner Drag Queen in our dear Cher, and that is nothing but a good thing. The Cher and Bob Mackie flamboyance reached its apex at the 1986 Academy Awards, at which, Cher attended in a sequinned skirt and cropped top (gotta’ love a girl that rocks separates at The Oscars) complete with black shawl and fluffy black wig/headpiece. Yeah, it’s amazing. So how do we scent this infamous, risqué and flamboyant moment? Well, we need a fragrance that is show stopping and challenging. Something big and obnoxious that doesn’t really care what people think of it – it simply knows that it is utterly fabulous and that’s all that matters. With all of that in mind I leave you with one simple name that perfectly matches the greatest of Cher, Bob Mackie and Oscar fashion moments – that word is ‘Fracas‘. Björk unfairly caught a lot of flack for her Marjan Pejoski swan dress in 2001. Sure, it does look like she killed one of the regal birds and wrapped it round her neck (the Queen must have been livid), and SURE she may have gone a bit overboard with the whole laying of eggs on the red carpet thing, but c’mon, this is Björk for frick’s sake – she has a licence to do whatever weird stuff she wants, because she’s a genius, and if you disagree with that, do feel free to meet me in the playground afterwards to ‘discuss’. The swan dress was when Björk was at her most creative. She had just won the Best Actress Award at Cannes for her surprising performance as Selma in Lars Von Trier’s heart breaking Dancer in the Dark and a few months later, she would release Vespertine, arguably her most beautiful album to date (and one of my all-time favourite albums, just FYI). To scent this iconic fashion moment – a bird in pure white draped on an artist from a land of fire and ice, I would pick the enveloping abstract floral musk of Puredistance I. This is a fragrance that is perplexing and beguiling, just like Björk. You knew this one would be on the list, didn’t you? It just had to be. I remember encountering this dress in person when I was a teenager at the ‘My Best Dress’ exhibition held at the Fashion & Textile Museum in London. It was as beautiful in person as it was on the screen, and its easily one of the most perfect gowns to have walked the carpet. Berry has never looked so fabulous (she rocks that short hair) and after becoming the first African-American to win the Oscar for Best Actress, she ruled the night. The colour of her gown – a resplendent ruby red – and the floral motif lead me to think of the euphoric rose of Editions de Parfums Frederic Malle’s Portrait of a Lady. This may seem like an obvious choice, red = roses after all, but ask yourselves this; has there ever been a more red-carpet-worthy fragrance than Portrait of a Lady? Exactly, there hasn’t. This fragrance, with its blood red raspberries and roses, and skyscaper patchouli is a showstopper made for this dress. It would be criminal not to pick it. Cate Blanchett’s Givenchy couture at the 2011 Academy Awards certainly was divisive. A vision in lavender with ornate lime green barnacles, Blanchett rocked one of the most unusual and fascinating gowns to ever grace the red threads of the world’s most famously-stomped carpets. Some dubbed it as a mossy-marine nightmare whereas others, myself included, instead saw it as an intricate display of opposing colours and details. “Unusual and fascinating” leads me to think of one perfumer, and one perfumer only – Vero Kern. If anyone’s creations were made for the red carpet, it’s Vero’s. She knows glamour and she doesn’t just create perfumes, she creates olfactory characters. Take Kiki Extrait for example, a sugary sweet lavender with green facets that is fun and frivolous. In fact, Kiki is the perfect scent to accompany the vibrant and colliding colours of Cate Blanchett in Givenchy couture. In all honesty, I’m not a big fan of Gwyneth Paltrow, so it pains me a little to feature her here. Sure, she’s a talented actress and a classic beauty, but she’s also quite annoying with her GOOPing and “conscious uncoupling”. That said, one look of her in this stunning Tom Ford piece at the 2012 Academy Awards and all is forgiven. Well, almost all – it really is hard to forget the stupidity and pretence of the phrase “conscious uncoupling”. This beautifully simplistic and timeless dress and cape (how good is that cape?!) was the first ever glimpse the World got to see of Tom Ford’s debut womenswear collection, and it didn’t disappoint. White is notoriously difficult to pull off on the red carpet and can often come across as a bit ‘bridal’, which would be a massive no-no at The Oscars (God forbid), but Paltrow managed to keep it very high-fashion with her sleek bob and natural make up. To accompany her iconic couture, GOOP requires something modern and glamorous, Narciso Rodriguez’s eponymous NARCISO, perhaps. But seeing as she is sporting Tom Ford, I doubt he would allow for any scent other than his own, so I’ll pick Fleur de Chine, a white, magnolia-centric floral from Ford’s Private Blend Collection that is full of old-school Hollywood glamour. This is one pairing that needs to remain consciously coupled. What are your favourite Oscar fashion moments? How would you scent them? Image 1 via pixgood.com. Image 2 somanylovelythings.com. Images 3 & 5 via desimartini.com. Image 4 via ticketsmove.com. Image 6 via blogspot.com. Image 7 onsugar.com. Posted in Article and tagged Academy Awards, Balmain, Björk, Bob Mackie, Cate Blanchett, Cher, Christian Dior, Dominique Ropion, Editions de Parfums Frederic Malle, Elie Saab, Elizabeth Taylor, Fashion, Fleur de Chine, Fracas, Givenchy, Gwyneth Paltrow, Halle Berry, I, Kiki, Kiki Extrait, Marjan Pejoski, Perfume, Portrait of a Lady, Private Blend, Puredistance, Puredistance I, Red Carpet, Robert Piguet, The Oscars, Tom Ford, Vent Vert, Vero Profumo. Bookmark the permalink.